I’ve been quietly working on various projects to bring them to completion so that I could start my next project. With Friday’s two finished objects, I could start that project. I decided to knit a Pas de Valse sweater next, out of Wollmeise Rittersporn. It’s so nice to be able to get sweater amounts of this yarn from time to time! I worked on this all weekend and have gotten surprisingly far actually. 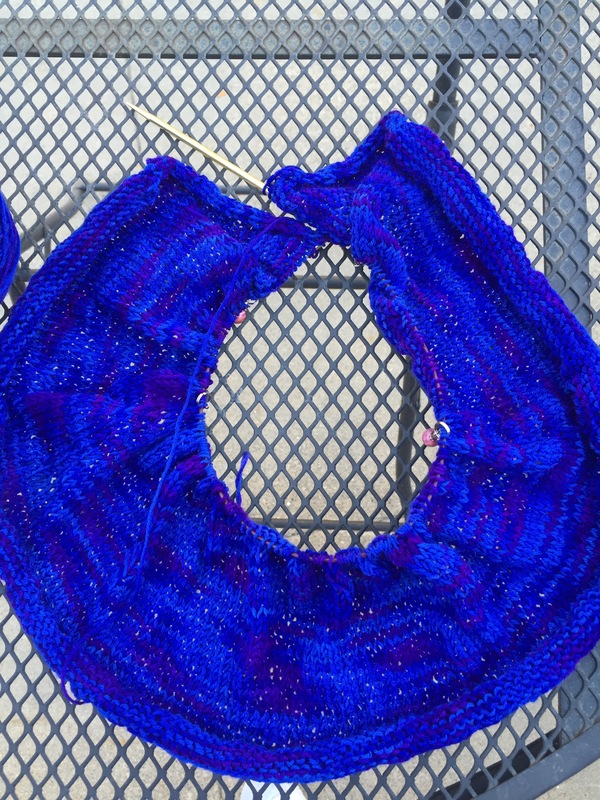 I have finished the waist shaping decreases, and have to now start the increases. I’d say that’s pretty good for a Saturday morning cast on. The picture is so bright! As is the yarn. Maybe I’ll get a better photo next time. I also need to switch out needles, as the ones I am using are on too short of a cable for all the lovely shawl collar increases. It’s just getting too squished at this point. I’ll try to get a better picture as soon as I get this on longer cables. Have a great week everyone! The color of that yarn is stunning. I can’t wait to see it!